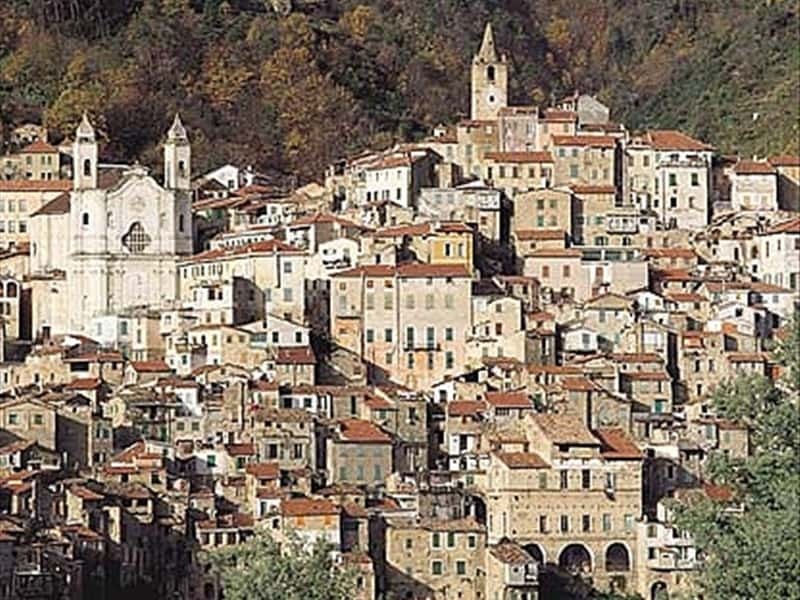 In the province of Imperia, Ceriana, from Latin Coeliana (name given by the family Celii, founder of the village), is a medieval city situated in the hinterland of Liguria on the steep slopes of a hill, a place where time has stood still. The stone houses, connected to each other seamlessly, high and narrow, seem to rise directly from the rock, and integrate perfectly with the surrounding territory, as if they were created by nature itself. It has numerous stone steps which often show continuity with those inside the houses. There are large squares, but tiny spaces between the buildings. Ceriana offers a spectacle of the past from the Oppidum, an arched doorway that leads to a passage where the floor is carved into the rock wall and is covered by a vaulted ceiling, creating a sort of tunnel. It was a Roman military settlement, chosen for its strategic location and the particular conformation of the territory. The village was founded between 979 and 1146 just on the top of the hill and then the layout spread towards the stream Arms, on the shores of which still stand oil mills equipped with the typical antique stone hydraulic presses still in use. Attacked several times by the Saracens in the IX and X centuries, defended relentlessly. First under the control of the Counts of Ventimiglia, around 1038, it became a rural county under the rule of Conrad, Bishop of Genoa. The town remained tied to the Archdiocese of Genoa until 1297, when it was sold to two wealthy Genoese Families. Ceded to the Republic of Genoa in 1359, Ceriana initially experienced a period of discontent, because of the excessive taxes paid, then the popular uprisings that resulted in the separation of Ceriana from Sanremo, which it was linked to on a common administrative point of view. In the first half of 1600, the town passed in the possessions of Savoy, then, like all the lands of the Riviera di Ponente, it returned under the rule of the Republic of Genoa. This new situation rekindled the old ill-feeling, caused by the high taxes, that exploded in a popular revolt in 1729. At the end of 1700 it was occupied by French troops. Ceded to the Kingdom of Sardinia, after the Congress of Vienna in 1861, the town became part of the Kingdom of Italy. The Parish Church of Saints Peter and Paul, built in 1768 and preserves several paintings and an altarpiece depicting St. Peter, of an unknown artist, dating back to 1526. Another older Parish Church, entitled to the same two Saints, located outside of the house and built between the XI-XII century. Rebuilt in 1513, it is now dedicated to the Holy Spirit. It features a steeple, and the lower part of the original structure is in Romanesque style. The Church of St. Andrew the Apostle dating to the IV century, erected on the ruins of the temple of Apollo. Remains of the columns of ancient temple are preserved within the church. It also holds a panel depicting St Andrew that dates back to the '400 and an organ of the XVIII century. The Oratory of Santa Marta built in the early del'400, that preserves the remains of saints and Placido Germanione and other relics. The Parish of St. Peter's '600. The Oratory of the Visitation, built on Roman walls in the second half of the XV century, is in Baroque style of Liguria. Inside, an altar of 1760, a marble sculpture of the school Maragliano, frescoes of 1784 on the walls and ceiling. The Oratory of St. Catherine, built in the XIV century, and it was rebuilt in Baroque style in 1737. The Church of St. John the Baptist. This town web page has been visited 13,985 times.